WASHINGTON -- The ministers leading the negotiations for a new NAFTA will be in Montreal for a longer-than-expected round of upcoming talks. 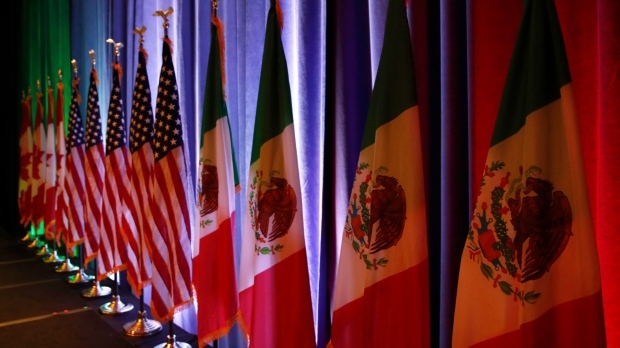 Foreign Affairs Minister Chrystia Freeland, American Robert Lighthizer and Mexico's Ildefonso Guajardo will attend the closing of the round on Jan. 29. The Montreal talks were originally scheduled to run Jan. 23-28. The ministers face some pressure to make progress in the negotiations. The current schedule of talks ends in March, and after that Mexico will be embroiled in an election campaign, followed by legislative elections in the U.S.
Signs that the process could become snared in electoral politics were illustrated today on Twitter: the presidential candidate for Mexico's ruling party tweeted that his country will never pay for the border wall, which U.S. President Donald Trump says will be funded by profits from a new NAFTA.